Capacities from 90 to 400 pounds. Part numbers ending in the suffix **RD**indicate round doughnut tread. Standard wheels come with a flat tread. ELASTOMER wheels offer the advantages of both hard and soft tread materials in a single wheel. Like a hard tread wheel, it rolls easily and is very durable. Like a soft tread wheel, it rolls quietly, protects floors and resists impacts with a cushion ride. It also features maximum weather ability, low temperature flexibility, resistance to chemicals, water and steam, and rejects floor debris such as metal shavings. 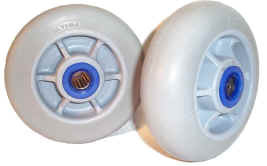 Non-marking thermoplastic elastomer tread is permanently bonded to durable polyolefin wheel core. Temperature range: -45°F to +180°F intermittent service (120° continuous service). Wheels available with other size bearings and other types of bearings. Please inquire. Part numbers ending in the suffix **RD**indicate round doughnut tread. Standard wheels come with a flat tread. Pictures above show round tread! !